The stadium is one of Brasília’s largest buildings. Renovation began in 2010, and it is now the second most expensive stadium in the world after Wembley Stadium in London. To accommodate World Cup fans visiting from all over the world, renovations were made to nearly all modes of transportation—particularly airports—in Brasília and other host cities. 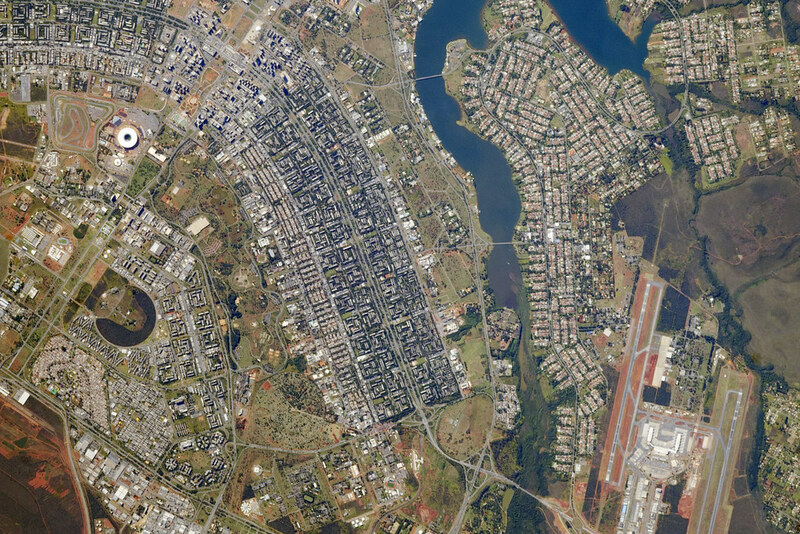 Brasília’s international airport is visible at lower right, on the far side of Lake Paranoá. Brasília is widely known for its modern building designs and city layout. Astronauts have the best view of the city’s well-known “swept wing” city layout, which takes the form of a flying bird, expressed in the curves of the boulevards (image left). The stadium occupies the city center, between the wings. Posted in Big Picture, Photography | tagged Brazil, Earth, Earth from Space, NASA, soccer, sports, World Cup. The permalink.